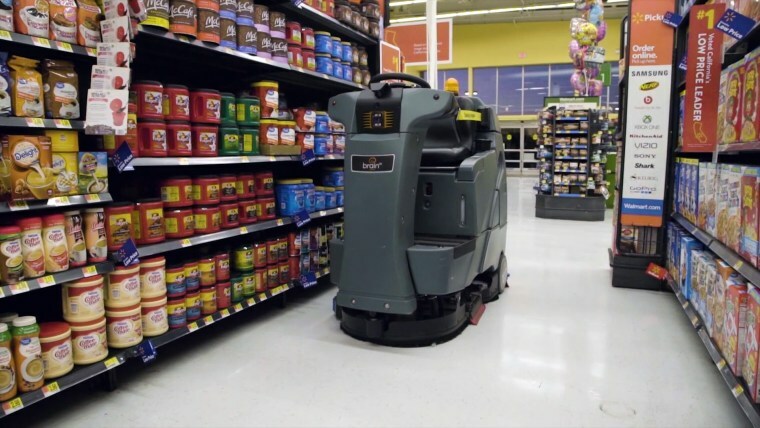 Starting next year, hundreds of robot janitors will be scrubbing floors at Walmart stores nationwide. Don’t mind that self-driving, Zamboni-style robot gliding through the aisles at Walmart. It’s just one of the retailer’s new janitors. Walmart will add 360 autonomous, floor-scrubbing robots to its stores nationwide by January, the company said in a joint statement with Brain Corp, which makes Brain OS, the artificially intelligent platform that runs the machines. The world’s largest retailer has already put more than 100 machines to work, with the help of Brain OS. When the autonomous janitors are in action, they have yellow safety guards on both sides, detering any customers who might be tempted to hop on and take a ride while cleaning is in progress. There’s a siren on top that lets people know with a subtle “beep beep” that it’s coming through to clean. But that’s not all it’s doing. Brain’s robots have sensors that allow it to collect information, which can be uploaded into a store’s cloud-based platform. For instance, as the robot cleans, it could collect data on which shelves are empty, according to one potential use case shared by a Walmart spokesperson. Walmart has already begun experimenting with automation: A shelf-scanning robot being tested in 50 locations alerts a team when items are out of stock or incorrectly priced; while another AI helper, Alphabot, quickly retrieves items in storage to help fill online orders. So do robots really do it better? On Brain Corp’s website, the company lists several benefits of their robotic floor scrubbers, including better cleaning consistency and coverage — another way of saying they do a better job than humans. But Brain Corp believes its robots help boost productivity, since staff can now focus on “higher value” tasks. "Brain OS is a powerful tool in helping our associates complete repetitive tasks so they can focus on other tasks within role and spend more time serving customers,” said John Crecelius, vice president of Central Operations at Walmart. Retail rival Amazon already has tens of thousands of robots whizzing around its distribution centers to help humans quickly fulfill orders, and is constantly exploring additional automation. Last year, Amazon was awarded a patent for a package-packing robot. Enlisting the help of robots to complement the work of staffers is becoming more and more common, but it will require humans to re-skill or risk losing their livelihoods. Around 400 million to 800 million jobs worldwide could be displaced by 2030 due to automation, according to a McKinsey report released last year.